Preschoolers and Toddlers love letters and they love making crafsts...so lets combine these together. It is amazing to see how much little kids love to learn about the Alphabet ... it just shows that kids were made to learn and soak up information. Two of my kids were obsessed with letters when they were toddlers and I always tried to work letters into every activity to take advantage of the situation. A really fun way to use Alphabet letters in a craft is to make people, animals, and creatures out of the letter shapes. Little kids think that this is hillarious. For example, the letter 'D' can be made into a 'Dog', a letter 'B' can be made into a 'Butterfly'. Of course, they will need help with the craft because they don't have the drawing skills yet, but they will still learn more about the letter and the sound that it makes. Some other Preschool ideas with Alphabet Letters are to make a matching game....such as the Memory Game. You can use caps or cardboard and make each letter, twice, so that you have 52 cards or caps. An alternative is to Make 26 Capital Alphabet Letters and 26 Lowercase Alphabet Letters...then the child will have to know what the lowercase letter looks like too - which can sometimes be difficult for younger children to grasp. A great idea for older kids is to use caps, buttons, or cardboard again and put letters on all of them. Then the older kids can put the letters together to make words. This is a great way to learn how to spell and read. Or...you can make a Hangman game by using magnets and a baking pan. You can paint a hangman game on the metal...this would make a great travel alphabet game. Another Idea is to take a lined piece of paper, draw all the letters on it, and then laminate that piece of paper. Your child can then practice his or her letters continuously. Young children love the idea of making a book of their very own. They like to show off about how much they know about the alphabet. 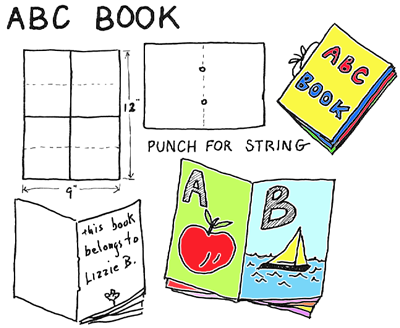 ABC books can be made either entirely with crayon drawings, or by a combo of drawing and gluing magazine cut-outs. For the book itself, use 2 sheets of 9"x12" construction paper for each book. Cut 4 sheets out of each piece 4 1/2" x 6", and fold each in half. This will make a book 3" wide and 4 1/2" high, with 32 pages, or enough for the entire alphabet, plus title pages and covers. Before doing any drawing or gluing, punch two holes in the middle of the folded part with an awl or hole puncher, and tie a string through the back to keep the pages together. How to Make an Alphabet Letters Tactile Guessing Game with Your Preschoolers or Autistic Children - Have the child close his eyes and feel letters to guess for Alphabet Letters Tactile Guessing Game Craft Today we are going to how to play a fun Montessori game that promotes good hand writing skills while also helping kids to learn the alphabet on their own. This is an educational, yet fun arts and craft activity for both you and your young children to do together. Making an Alphabet Letters Memory Game from Bottle Caps with Printables and Instructions- Today I will show you how to make a really cool Memory game that is great for any age child, but especially good for preschoolers and Kindergarteners who are still working on Alphabet Letters recognition. If you don’t have enough caps, you could also use coins, checkers, cardboard, or whatever else you have lying around the house. Learning to Sound Out Words with Alphabet Sticker Legos - This is a great craft to teach kids to sound out words. They love playing with legos and Duplo blocks so use this to your advantage. Place labels with alphabet letters on them and have them spell out words. Alternatively, put sight words on them and they can put sentences together with the Duplo blocks. Letter A Alligator Paper Craft - Today we will show you how to make this alligator out of a Paper Letter 'A' and some other cut-out pieces of paper. Cherrios Names - Have the child trace the letters in their names with Cherrios to help them familiarize themselves with these important letters.